Really great experience. Would stay again. Receptionist staff member Amy was super friendly and made some recommendations (all of which we followed). She was very helpful and attentive at all times. Perfect for our work related stay. Clean, comfortable room and good shower - would stay again for this alone. The shower liquid dispensers on the wall were a waist of time as they didn't produce anything or very little. If I stay again I'll need to remember to bring my own soap and shampoo / conditioner for the shower. The Service/Staff/Value rating was less than very good due to the breakfast. I expected to have the choice of orange juice and black tea on the buffet, but no juice was available and the black tea container was empty with advice '...yes it is, sorry we don't have any'. I appreciated an early check in on the day I arrived, being able to get some sleep after flying through a short night made our trip much more enjoyable. Everyone was very pleasant and helpful. I really love the snack and drink area and find the apples a lovely touch. Loved the comfortable bed. Thank you! Comfortable, clean with wonderful professional but friendly staff. Great breakfasts. Midweek 'complimentary drink' hour a great idea. 5 minute walk from Skybus depot with a tram stop at front door. I arrived early but the staff were willing to watch my bag, so I enjoyed watching Australian Open. Staff are always friendly and honest. I will stay here again next time I visit Melbourne. Had a wonderful stay. One our favorite places we’ve ever stayed. The room was great, breakfast was tasty, staff was friendly and helpful. Enjoyed the happy hour, lollies and coffee. Would definitely stay at the Alto again. friendly staff. enjoyed playing some board games. Excellent location inside CBD, easy transport to/from airport. Take the free tram to other tousirst’s spots.free laundry on site is a big plus after hiking/camping along Great ocean road for a week. Small kitchenette is very nice, too. Really enjoyed staying in a smaller hotel. Having a freshly cooked breakfast every morning was great. Also liked some of the little additional things that the hotel laid on - like drinks mid week. Staff friendly, lounge/relaxing area excellent. Great Southern Station, taxi rank and convenience stores near bye. Were able to booking 2 hours early. The service is fantastic here. Will always come back when visiting Melbourne. The lady at the service counter went above and beyond with sorting out an issue with a 3 party booking service (a mistake made on my end) nothing was a hastle when asking questions or needing assistance. Thanks guys! 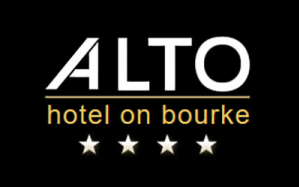 We always enjoy our stay at the Alto. We’ve stayed there every time we’ve visited Melbourne. Excellent staff especially the staff on reception on Friday 4th January afternoon - cannot thank them enough for making our stay memorable. Really impressed with their service! We booked two rooms.